Harvest Moon Acres Corn Maze & Fun Park | Gobles, Michigan | Corn maze and more! Welcome to Harvest Moon Acres Corn Maze & Fun Park. We are southwestern Michigan's place for outdoor family fall fun! 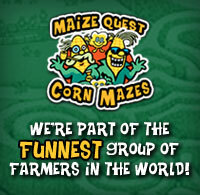 A variety of attractions including a 5-acre Corn Maze, Fun Zone, Farm Animals, hayrides, and more awaits you. We are open for the 2018 season from September 22nd to October 28th. Come visit us in the picturesque southwestern region of Michigan! We're conveniently located between Grand Rapids, Michigan and South Bend, Indiana - near beautiful Lake Michigan. 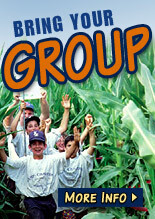 Bring your family or group - or call ahead and let us help plan your next group outing or birthday party. Be our guest and have a great time out in the country! Take aim and launch a pumpkin with our pumpkin slingshots! 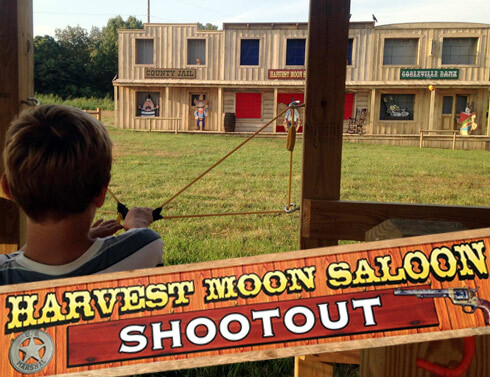 Test your skill by aiming at one of our Western targets, including several trouble-making outlaws. This popular attraction is included in the price of admission.